Thanks to all the time I've wasted playing around with my solar telescope my Tesla coil kit has been sitting here gathering dust. I bought a microBrute kit from Eastern Voltage Research. It's a sophisticated solid-state design with no neon sign transformers, no huge capacitor made out of plate glass and no spark gap. The kit is almost complete and a great value. It includes the coil forms and even a torroid. Not included are a base, a cooling fan, and IEC sockets for the AC cords (I'll add those to the base I'm going to make). Note that this is NOT a project for beginners. Although the instructions are quite good and give you the color code for each resistor, I wouldn't recommend this for your first outing with a soldering iron. 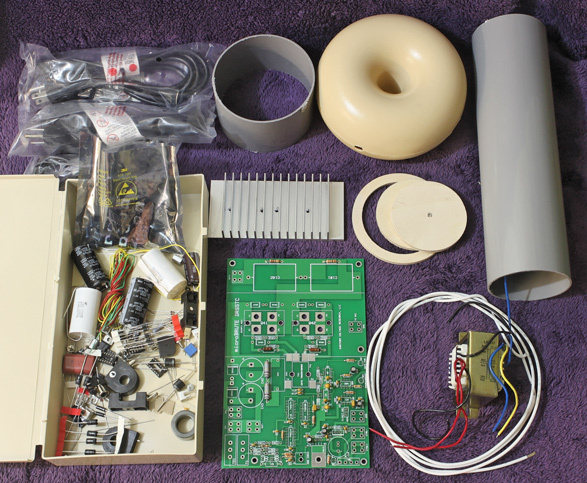 For example, look at the box full of parts in the picture—can you find a .01µF capacitor or a 1N4128 easily? Note that the IGBTs that drive the primary coil are easily damaged by heat and primary/secondary arcing. Replacements cost $18.82 apiece at Mouser. You'll have to mount the PC board on some sort of base with a fan (not included) blowing directly across the heat sink. To top it all off, you'll be using mains voltages right on the PC board and the HV discharge from the secondary could seriously burn you. So far I've only started stuffing the PC board. Next I'll have to build a jig for winding the secondary and do the actual winding.